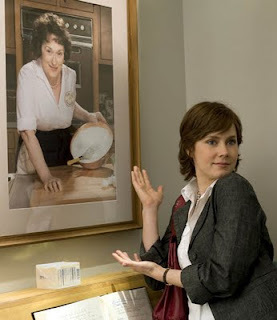 As shallow as a soufflé, Julie & Julia is a puff pastry of epicurean ecstasy. It is a testament to the enduring talents of Meryl Streep and the iconic chef she portrays. But, in the vacuous hands of director Nora Ephron, it is an example of subtraction by addition, as two storylines that would barely sustain a feature-length film by themselves are diluted to the point of near irrelevance (in the case of Julie) and paucity (in the case of Julia) for the sake of splicing them together under a single title. Simply put, the ingredients don’t mix. Streep is a deservedly acclaimed actress, and she is a mistress is two characters traits: accents and the ice queen. Thankfully, it is Julia Child’s Boston Brahmin brogue that Streep emphasizes for her charming, disarming portrayal of the famous chef, author, and television personality. The Julia-half of Ephron’s screenplay is drawn from “My Life in France,” Child’s autobiography that recounts the culinary experiences she and husband Paul Child (Stanley Tucci) indulged while living in post-World War II Paris and Marseilles, along with the infancy of her writing career. Streep and Tucci – reuniting after costarring together in The Devil Wears Prada – portray these as heady times for the Childs, full of the wonderment of French culture and cuisine juxtaposed against the dismal tide of McCarthyism swamping citizens at home and foreign diplomats working abroad, like Mr. Child. Against the glare of this iconic spotlight, the marginalized (or not outright marginal) protagonist of Julie & Julia is actually Julie Powell (Amy Adams), a struggling author who cures personal and professional malaise – and jumpstarts her literary career – by starting a Web blog in 2002 chronicling her mission to cook all the recipes in Child’s “Mastering the Art of French Cooking” over a year. We’re told that the tie binding these two is that they are both strong, resourceful women who find inspiration in the joy of cooking. Thing is that Julie’s domestic travails in her tiny New York City apartment and her post-September 11th job inside a cubicle working for the Lower Manhattan Development Corporation pale in comparison to Child’s worldly ventures. The film is satisfied with the morsels of manufactured tension it concocts along the way (particularly during Julie’s timeline). Still, it is telling that its funniest scene is the replaying of a 30-year-old Dan Akroyd skit. Moreover, Ephron eventually tethers a giant elephant in the kitchen near film’s end. I suppose the director and Powell deserve some measure of credit for including the dim view the actual Julia Child held for Powell’s Internet adventures in cooking. But, by addressing the rift only in passing, it serves to erode the essential connection between the two women suggested by both the screenplay and the film’s title. It also further minimalizes Powell’s standing in this two-headed narrative, making you wonder whether it was more than the rain that caused Child’s longtime publisher, Judith Jones (Erin Dilly), to cancel a dinner date with Powell. They are both talented actresses, but in Julia & Julia (just as in Doubt), Streep gets to chew the scenery, while Adams gets consumed by it.